This topic contains 0 replies, has 1 voice, and was last updated by ADDIE 3 months ago. 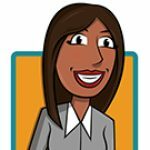 I am new to the instructional design profession. I took this job– which I love– because I taught online, used flipped classroom strategies, and redesigned my course several times; it was not because I have any training or academic background in the field of education. I also did not have the support I needed from my first supervisor (who has since left). I am looking to update my image because my faculty see me and automatically think “oh, you just want me to teach online!” or “you are making me take this survey‐who are YOU to tell ME what to do? !” For the record, my former supervisor had a different, more authoritative approach that may have contributed to the current ID/faculty relations. I really want to improve my faculty’s understanding of what instructional designers do. How I can help them design and develop great courses for their students. What do you suggest? I understand how you feel! New instructional designers can have a difficult time conveying their role clearly to faculty. 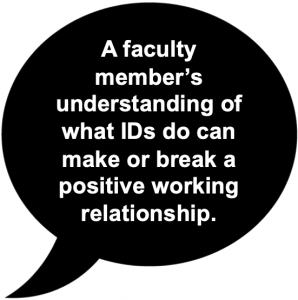 A faculty member’s understanding of what IDs do can make or break a positive working relationship. The first step is to define clearly the roles of ID and faculty member along with the ways these roles overlap and complement each other. The faculty member is the subject matter expert, while the ID is the expert in implementation of the content in an online environment. Clearly understanding and working within these roles is the key to mutual respect and can also take the pressure off when you need to ask something of the faculty member. It might also help to show an example of a previously developed course, either designed by you and another faculty (or another ID’s example if you are brand new). Show the faculty member the elements of the example course that were likely impacted by working with an ID. Exemplifying the collaboration that goes on in a course design can help the new faculty understand how the process works and the shift in teaching philosophy that happens when moving from traditional face-to-face lectures to a more active approach effective online learning. Also, it is a good idea to establish and maintain good rapport with your faculty member for a great working relationship. For example, IDs who convey empathy for the instructor and can “stand in their shoes” are more likely to build rapport with faculty that IDs who don’t make these efforts. Then, with that insight, use your pedagogical expertise to create something awesome together! To maintain rapport, try sending your faculty an email notifying them about a new tool to keep the rapport going, rather than sending them a survey out of the blue. A few of these ideas have helped me and my fellow instructional designers in the past, but I’m sure there are other possibilities. To the community, I pose this question: What have you done to improve your faculty’s understanding of the ID role and create great collaborative relationships? Do you have any tips or tricks? Please share them in our Community of Practice!